Vice President Joe Biden tries to stifle a laugh during a 2014 reception in Washington, D.C.
How many Donald Trump jokes can be made in one night? Let the Gridiron Club count the ways. The D.C. journalism and political establishments gathered on Saturday night to make fun of themselves and an increasingly unpredictable presidential campaign at the Gridiron Club and Foundation's 131st Anniversary Spring Dinner. Vice President Joe Biden was the headliner, and speeches were also delivered by potential vice presidential contenders: South Carolina Gov. Nikki Haley and Housing and Urban Development Secretary Julian Castro, who tagged-team his speech with his twin brother, Joaquin, a member of the U.S. House of Representatives. Per tradition, the night was a mix of speeches from politicians and skits, performed by Gridiron journalists, accompanied by an orchestra and a few professional singers. The sung skits were punchy, even if the song references were dated. A song mocking presidential candidate Donald Trump was set to the melody of "Springtime for Hitler," with one parody song delivered by a Trump impersonator called "Heil Myself." As the chorus, performing from behind a fake border wall, repeated the line "every wild angry white guy," the Trump impersonator belted out lines like "Look at me!" and "Stand and cheer!" Of course, Trump wasn't the only one mocked. Later in the evening, a scolding Barbara Bush was portrayed lecturing her son, failed presidential candidate Jeb Bush, to the melody of the song, "Blues In The Night (My Mama Done Told Me)." A Bernie Sanders impersonator was "Sandersista," dressed as a Soviet communist, mocked with a song set to the melody of "Mr. Sandman." A sequin pant-suited Hillary Clinton sang, "You don't have to say you love me, just give me the job," to the melody of the Dusty Springfield classic, "You Don't Have To Say You Love Me." "Yes, I'm gonna stay forever," the impersonator continued, "kind of like the mob." The musical numbers were separated by the speeches. Nikki Haley's was full of jabs at her audience for the night. "When the press makes fun of itself, they call it parody," she told the room full of press. "When the press makes fun of Republicans, they call it journalism." And she, like just about everyone else behind a microphone that night, delivered a few Donald Trump jokes. "I won't really feel like I've made it," Haley deadpanned, "until Donald Trump demands my birth certificate." The brothers Castro took to the podium dressed as two other Castro brothers: Cuba's Fidel and Raul. While still in character, they mockingly endorsed "Comrade Bernie Sanders, a true son of the revolution." Vice President Biden closed out the night, aided by teleprompters. He joked several times about his decision not to run for president, and how he might have liked that job. And he gave some mocking advice for Castro and Haley, potential future VPs. "At all major bill signings," Biden said, "the mic is hot!" He even touched on the brewing fight over a new nominee to the Supreme Court. Biden suggested Obama nominate Texas Sen. Ted Cruz, and how that might alarm even the justices themselves. "Before you know it, you'll have eight more vacancies." But of course, he had to joke about Donald Trump, as well. "Donald's attacked every person of color," Biden said, "except John Boehner," mocking the former House Speaker's tan. Biden hit Trump on the awkward endorsement he got from New Jersey Gov. Chris Christie, too. "Tonight I call on Donald Trump to be a man of his word and release Chris Christie now." Towards the end of his remarks, Biden got serious. He quoted Churchill, saying of the current Republican race, "When eagles are silent, the parrots begin to jabber." After joking about whether his father or Churchill actually uttered the line, he continued to decry the tenor of this election season. 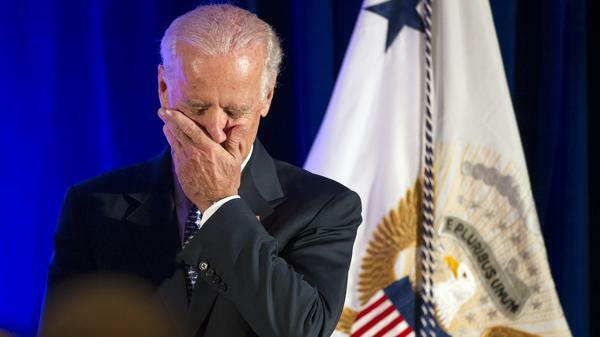 "Think how we conduct our politics today," Biden scolded. "Truth is, we're all to blame... As well as some of you, by the way." "Our kids are watching," Biden said of the election. "The world is watching." A few lines later, he remarked, "The American people are better than this." Biden ended with a few more jokes, but the sermon portion of his remarks may have been the most lingering. Even in a night of jokes, the race for president in 2016 was no laughing matter.